The face of veterinary medicine is extremely different from what it used to be a decade ago. It is imperative for veterinary practices large and small to embrace these developments, to stay relevant in changing times. Whether you are a veterinarian who is fresh out of college or a seasoned practitioner, these tips help you brace competition, improve your reputation, make your vet practice financially stable, and ultimately grow your business so that you can reap better returns. Being technologically advanced gives your practice a certain edge over the others. Not all practitioners can afford state of the art equipment in their clinics, hospitals or care centers, but holding on to obsolete tools and treatment methods definitely can be a put-off for most clients. The key is to invest in good quality equipment that is fairly modern and to use up to date techniques that are affordable to the clients and their animal friends who visit your practice. Technology also encompasses taking the digital route in your practice. This means digitized medical records, exams room, lab work, pharmacy, admission blocks etc. made possible through a veterinary practice management software. 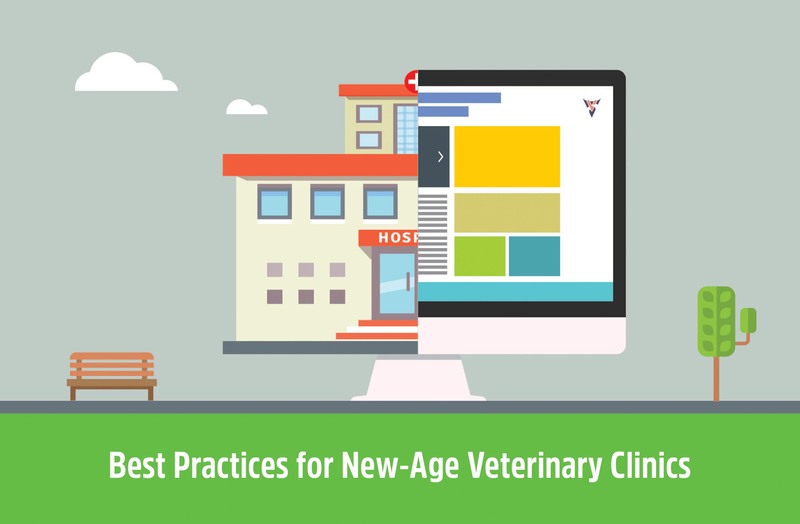 Embracing technology improves your day to day functions and impresses clients with the professionalism you display in handling your veterinary clinic or hospital. Success in veterinary practice isn’t derived from a magical formula. What works for one kind of veterinarian or clinic may not be equally relevant to another. However, these suggestions and best practices help you improve practice so that you can reap the fruits in the short term and over a longer period. Any good veterinary practitioner needs to invest sufficient time and effort into staying abreast of changes in veterinary medicine and technology. Ongoing education through participation in seminars or certification in recognized courses as well as accreditation show existing and prospective clients that you value care standards seriously and pay attention to best practices in animal care. Veterinary practitioners often lose business because they aren’t really ears for what their clients have to say about them. When you and your staff pay attention to what pet owners like or dislike about your clinic, it shows how much you care for them and their animal companions. Feedback is a great way to fine-tune your practice to meet or exceed the expectations of customers who visit your clinic. This can be collected through a simple survey printed out on forms or be conducted through a veterinary PMS. Veterinary practice isn’t just about healing and caring for animal friends. People today consider veterinary practice equivalent to a service and expect adequate value for the money they put into keeping their pets healthy and happy. For this reason, a clinic whose treatment options are inappropriately priced can soon fall out of the competition and suffer. To avoid this, compare your veterinary offerings with that of other care providers in your area or locality to see how you can offer affordable services to clients while paying off your bills and expenses on time, and making money for yourself. Do this from time to time to ensure that you stay competitive even when shifts occur. While you spend a considerable time treating, immunizing, and nursing sick animals back to health, all these activities make up only a part of your practice. The interactions that the clients have with your admin staff, technicians, nurses, and others in the clinic have an equally important impact on the perception of pet owners about your practice. 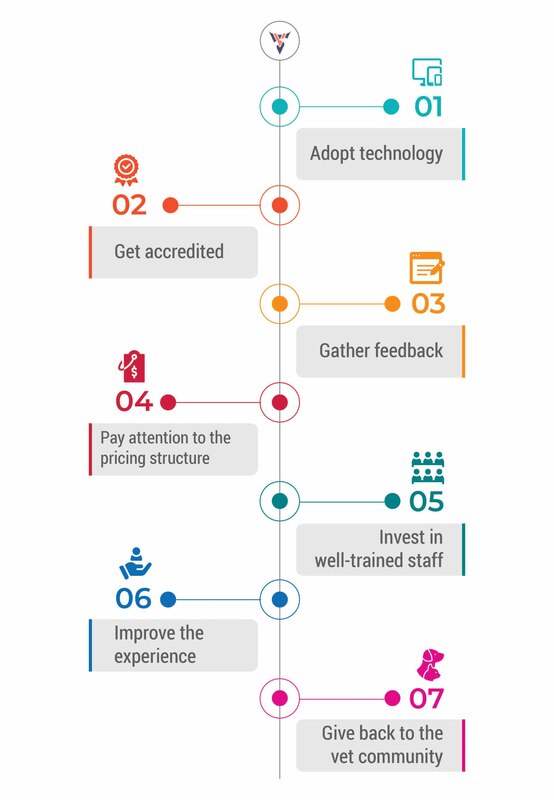 Hiring the right staff and training them in best practices makes a huge difference in the way your clinic or hospital functions. This ensures that any interaction that they have with clients is a pleasant one and that all needs of pet owners and their animal buddies are adequately taken care of. Treatment constitutes just one part of veterinary care. The experience that customers and pets have at your practice can leave a lasting impact. So, be sure to asses your clinic from time to time through the eyes, nose, and ears of not just the client but also the patient. Is the reception area welcoming? Does it have enough space for patients who need to wait? Is there unused equipment lying around? Are there service bottlenecks? Check with the staff as well to see on what their thoughts and feedback are. Things that skip your attention often garner that of the staff, who spend almost the same amount of time in the practice area as you do. You could also consider retailing pet and animal care products out of your clinic for an enhanced experience. While not mandatory, clients appreciate it when you have snacks, toys, carriers, harnesses, and others stocked up in your clinic. Whatever you display on the shelves is an assurance that the products have been handpicked by you or your staff for the benefits that they offer to animal companions. So, be sure to pick and choose products with care. The years spent in to receiving veterinary education and treating sick animals equips you with loads of experience, which can be put to good use outside your practice. As a well-educated, well-trained, veterinary professional, you could put some time aside to pen down your thoughts and observations on veterinary medicine or the industry through blogs on websites, social media pages, or other direct marketing materials. You could utilize the platforms to also interact with pet owners or like-minded professionals for greater outreach. The more omnipresent you are, the more your practice flourishes. Alongside publishing, you could also involve yourself in charity work or social service by sponsoring non- profits, local veterinary events, animal welfare institutions etc. Not only are these good things to do but they also establish respect for your practice among the community and drive referral business exponentially.